Medicinal plants have been helping humans heal for centuries, providing everything from pain relief to palliative care. Some of the strongest medicines on Earth are still derived from plant sources, such as drugs used in chemotherapy to ones that regulate heartbeat. Dispensing these potent treatments carefully and accurately are dedicated pharmacists around the world, whom we celebrate each year on January 12th. National Pharmacist Day recognizes the knowledge and attention that goes into this important role by honoring pharmacists for their efforts towards medical care. If you have a pharmacist that’s important in your life, celebrate the day with a fresh bouquet of some of these fabulous pharmacological flowers. Digitalis purpurea is a tall flower made popular in English cottage gardens. Straight stems reach several feet and are topped with lovely layers of pendulous blooms that droop daintily downwards. Each individual, bell-shaped bloom has a a throat that is lighter in color and spotted with intricate patterns inside. Coming in colors of pinks, purples and sometimes whites, these gorgeous flowers are one of the strongest heart medicines in the world. A cardiac glycoside, the powerful chemicals in foxglove are commonly prescribed to help a heart beat more strongly. Help your pharmacist’s heart beat a little faster with a few fresh stems of foxglove. Sometimes known as vinca, this pretty annual commonly grown in flower beds is one of the leading treatments for leukemia and lymphomas. Shiny green leaves stand upright from the short, straight stems and are topped by pretty pink or white flowers that often had a darker center. 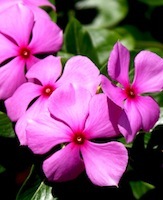 In the Victorian language of flowers, vinca is said to represent love and the pleasures of memories. Make a memorable impression on a pharmacist who is dear to you with these potently pretty flowers. Perhaps one of the more chemically active plants cultivated by humans, the colorful poppy, Papaver somniferum, is the main ingredient in morphine and codeine, as well as the narcotic heroin. Tall, slender stems hold up fuzzy, perfectly-formed buds that open up to reveal papery petals in a variety of flashy colors. There are several different species of poppies available from florists that will delight on National Pharmacist Day. These medically-important flowers may be ones that your pharmacist recognizes in milligram pill, but may have never seen in bloom. Surprise them this January 12th with a healthy does of flowers.